Sometimes it’s the easiest things that are the hardest. A friend asked me for ideas about what to do with cauliflower, or more specifically, “What do you do with cauliflower?” I got so wrapped up trying to do a good job that I did no job at all. I wanted to keep it simple, but it ended up getting very complicated. Let’s not go there. If something takes too long, or makes too much mess it’s just easier to give up and eat out. There are lots of things you can do with cauliflower. Let’s keep it fast and easy. Boil: Combine 1 bag of frozen cauliflower and enough water to cover completely in a medium saucepan. Add 1/2 tablespoon of reduced sodium Better Than Bouillon roasted chicken base (or a chicken bouillon cube, or substitute chicken broth for the water. You can also use vegetable bouillon or broth). Bring to a light boil, reduce heat, cover and continue to cook until soft. Puree with a hand held immersion blender or in a blender. You should end up with a very thick, mashed potato-like consistency. Taste and adjust seasonings. You can stir in a little more chicken base if you think it needs it. Add salt, ground pepper, fresh or dried herbs, a splash of cream or non-dairy milk of choice, or some freshly grated cheese. Use this cauliflower puree as a side dish, or thin it further and make a soup. You can also serve it grits-like, in a bowl, topped with shredded meat or grilled shrimp. Roast: Cut one head of fresh cauliflower into same-sized florets. Toss with a little olive oil and spread onto a parchment or foil lined baking sheet. You can roast at anywhere between 375º to 450º F until you have lightly browned, tender pieces. This is one of my favorite ways to eat cauliflower. Once browned, I like to top it with red pepper flakes, a teensy bit of sea salt (flavored salt is good here), a teaspoon or two of drained capers, fresh ground pepper, and some shaved parmesan or pecorino romano cheese. You could also add some raisins or toasted breadcrumbs, or a little chopped fresh parsley, for color. Raw: Use as a dipper for salsas, hummus, or your favorite salad dressing. Pickled: Cauliflower is really good pickled. I recently saw pickled cauliflower at, you guessed it, Trader Joe’s. I bought a jar to try, mostly because it made me feel sentimental about my Italian grandmother. Try it. It’s good. And, if you are looking for more ideas, here is a link to all things cauliflower from the kitchn. For now, here is a new way to use roasted cauliflower that is absolutely delicious. It is fast, easy, vegan, gluten and dairy-free. It will make you say, “This is SO good! I have never had cauliflower like this before!” At least that’s what my tester said… It is from Gwyneth Paltrow’s new cookbook, “It’s All Easy.” Here is Gwyneth’s recipe. See for yourself. Preheat oven to 450º F. Put cauliflower on a baking sheet and toss with the curry powder, sea salt, and olive oil. Roast for 20 minutes or until just beginning to brown and crisp. 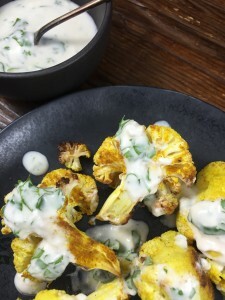 While cauliflower roasts, mix Vegenaise and lime juice in a large bowl. When the cauliflower comes out of the oven, transfer to the bowl and toss with the Vegenaise mixture. Add cilantro, mix all together, taste for seasoning and serve.